Gooooooood Afternoon everybody! Thank You kindly for our spotlight on plastic entries! Winners will be announced on 15th March. This is our last spotlight here, we will be moving them to the new blog just to give us some space and reduce confusion so the one after this will be in its new home HERE so please do follow! Our new spotlight challenge which has been set by Joy who has chosen Silhouettes. Your design must contain a silhouette(s), preferably as the focus of the card. We're being sponsored once again by Stitchy Bear Stamps who have provided the team with fabulous silhouette images from her range, she has got a LOT to choose from! Over to the team and our creations! I used the digi stamp watching you and printed it onto white cardstock - my printer has been playing up recently and any tone on an image is printing out green (?!) in this case it works quite well but it can be a bit of a nuisance! I used distress ink to colour my cardstock and sprayed some Dylusions ink to give the splattered effect. I made the flowers with lengths of twisted gold net, adding a light spray of the ink and finished off with dew drops to the centres. For my demo this week I chose Dance Fever silhouette from our sponsor. As it is a digital image, I thought I'd give it a digital-hybrid 'treatment' and printed out my digital layers before decoupaging them, finishing with an acetate layer adhered with four real screws! The background paper and mat are my own Eiglas digi papers. I love silhouettes - especially digital ones! 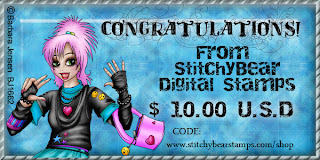 This one is from the Touch of Class set from Stitchy Stamps. For this card, I added a frame and some leaves to the image, then printed it on film. The background uses some images from a CD, some PSE generated trees and shadows, and is printed on paper. The two layers are separated by foam pads to give some depth. 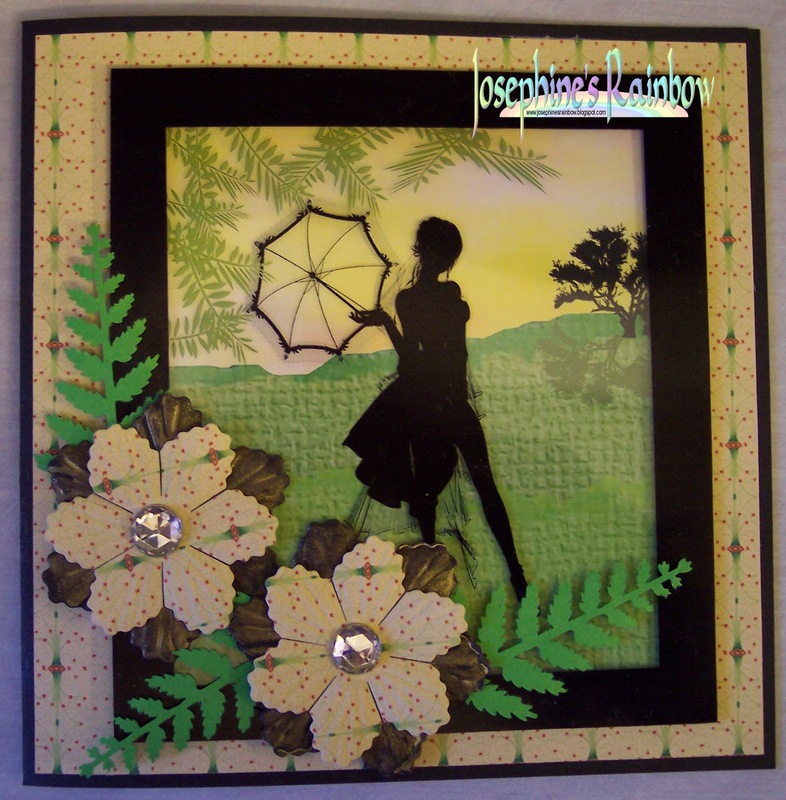 I finished the card with some die cut flowers and punched ferns. 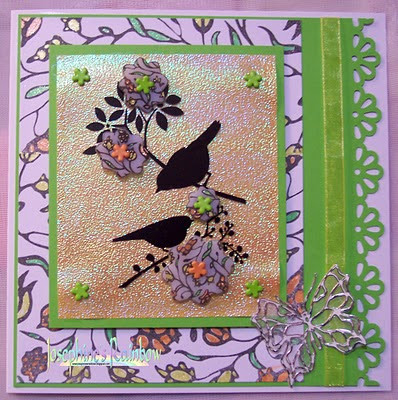 I ended up making 2 cards for this spotlight choice as had made the flowery one before i received my silhouette image from stitchy stamps. For this card I used 'Reach'. It really is a beautiful digi stamp and from the moment I saw it I had ideas bouncing around my head about what I wanted to do with it! I have created the background using Cosmic Shimmer Mists sprayed over a piece of glossy photo paper. I was really worried when I was making it that the inks wouldn't stick and that it would end up a big slidey mess, but a gentle drying over with my heatgun set the colours and to my surprise created a surface which my printer actually let me print on! This was good luck more than anything else I think... I finshed of the card by trimming the image piece to a square and matting onto a slightly larger black square and then added some diecut corners to create a frame. For this I used 2 images by Stitchy Bear Stamps - Dolphin silhouette and Relax making a scene which coloured with promarkers using the letrajet airbrush. I've added sparkle to the water with sakura stardust clear pen. 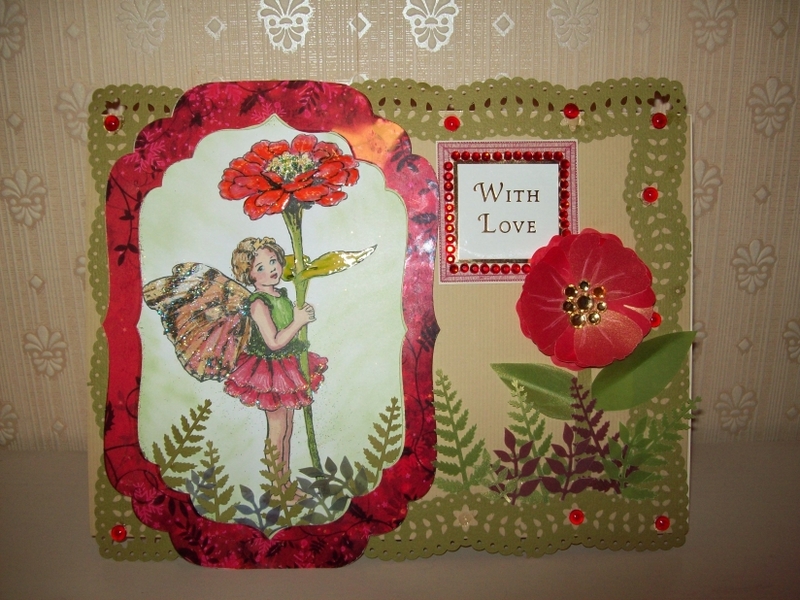 Welcome back to Crafty Cardmakers and wow thank you all so much for your fabulous hearts entries! We're still working our way through so if you've not had a visit yet we'll get to you soon! First up I'd like to say a goodbye to Sheila who's stepped down as she can't give us the commitment at this time but she may step back in the future! And also a welcome to our new baby member Poz who's really new to blogging and is just going to watch what is going on until she's ready to dive in with us! Next on the agenda is a DT Call Oooooh! We are going to be moving the Spotlight Challenges to their very own Blog soon to make life simpler. We're just spreading out a bit lol! 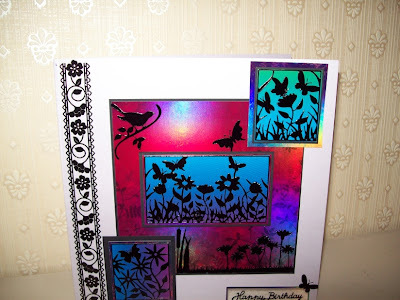 The new blog is CRAFTY CARDMAKERS SPOTLIGHT CHALLENGES so be sure to follow us there too! The DT Call details are over there :) They will start over there on 14th March so it simply means the challenge will be posted here and the spotlight challenge there. Gill has set our challenge today and she's makng it a bit trickier! She'd like to see you use Fairies AND at least 2 punches. Die Cuts do not count sorry, we all know what punches are so drag em out! So over to the team! I enjoy this wee Challenge but not sure the card is really me! Think the papers are a bit busy but kinda work all the same! I used the Wags 'n' Whiskers Fairy Angelica coloured with promarkers and glitter on her wings! 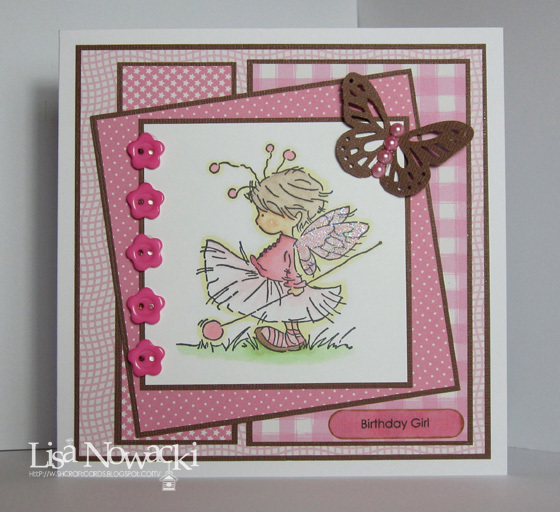 The papers are the new Prima Sweet fairy layered on pink card! i used my Xcut daisy border punch and my Xcut daisy punch for the wee flowers! the butterflies are made with my Martha Stewart punch and a wee butterfly punch I've had for years! Finished with ribbon, lots of glitter and a wee ticket! I've used a digikit to make another hybrid page for this challenge. It's called 'Fairy Story' by Linda Rechtin ©2007 from DSP. I printed out the bp's and the elements plus a photo of my Ada when she was younger and decoupaged the project, adding bits of bling and using Martha Stewart punches for around the page, the corners and for the handmade flowers. I also added some glitz with my Copic Spicas. For my card I have used a fairy stamp from a Debbi Moore set, I have coloured her with Promarkers.I have used Papermania backing paper and punched along the bottom and top with an X-cut punch.I have also added a border that I have punched with my Martha Steward Trellis punch.The larger layer of the flower I have cut with my Cricut and then just added a paper flower and brad that I glittered with purple stickles. Oh I just love fairies. 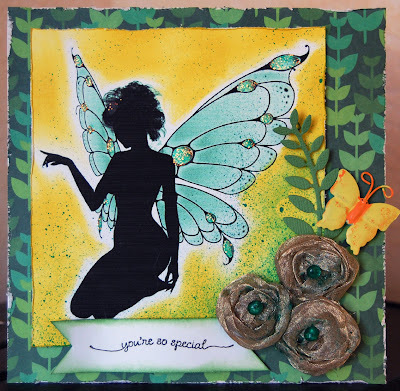 So for this fab challenge I decided to get out a Sweet Pea stamp, it's Forest Blue by Ching-chou kuik. She is watercoloured with Whisper pens and Sakura stardust pens. Part of the challenge is to also use at least 2 punches. I've used an EK Success Corner Adorner to mount the image and a GeoPunch (Daisy) to make the border. I've also used lots of other bits and pieces and will post full details on my blog. I have used a digi from Mo Manning, which I watercoloured with Lyra Aquacolours, apart from the teacup itself (not the flowers on it) which I have coloured with the glimmer mists I used to make the ribbon. The ribbon is seam binding which I spot dyed with three different glimmer mist colours, the left over bit I used to make a bow. I have threaded the ribbon through the card to give this ruffled effect. My two punches are MS Doily Edge and PAP Layered Arhces. The pins I made myself. More details on my blog. Well I perused my digistamps collection and do you know I only have 6 images of fairies? They not normally my cup of tea but I am embracing new things and this was lovely to colour. 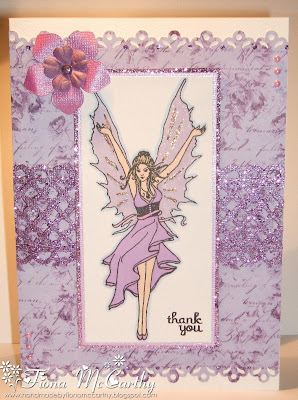 The image is by Prairie Fairy, coloured with Promarkers & a Sakura clear glitter pen from Joanna Sheen. I have used a Martha Stewart border punch and 2 flower punches and made my own hatpin embellishment. he little butterfly is a mirrored embellishment which I added some gems to. I just loved making this one. 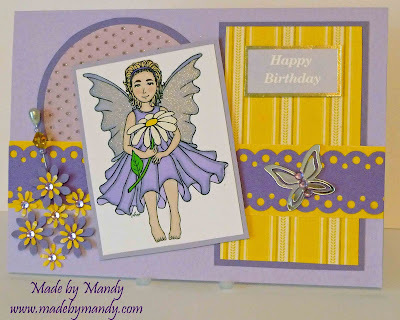 I really enjoy making pretty girly cards, so this challenge was right up my street. I used a very cute LOTV image and coloured her with Promarkers. I added a little Cosmic Twinkles to her wings but it hasn't shown up very well. I used 8 punches in all, 4 Martha Stewart's, 3 Nellie Snellen's and 1 Mc Gill. The papers I used are freebie's that came with a magazine last year. I did a little faux stitching with a pokey tool and a Sakura gel pen. 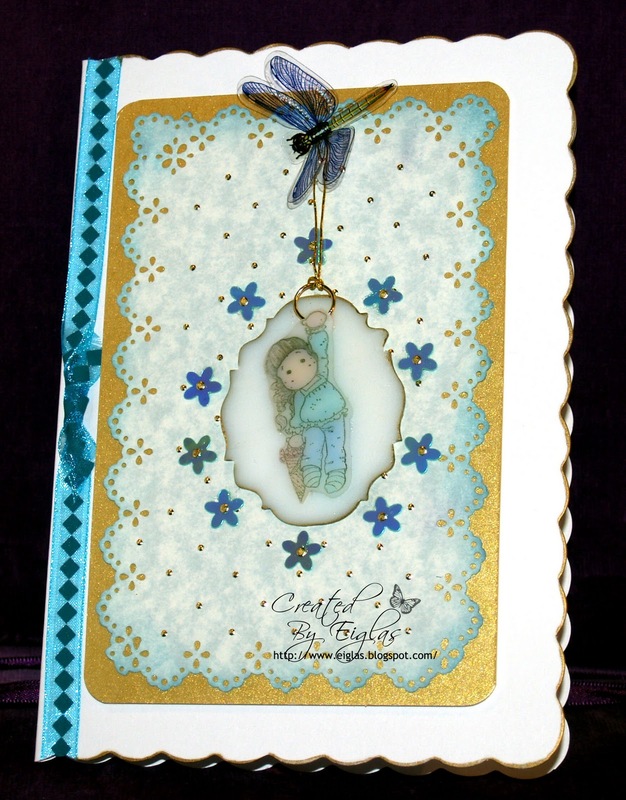 Then added a Craftwork cards sentiment and some dewdrops from stash. I've used a LOTV stamp, coloured with promarkers, and added glamour dust to her wings. The papers are Dovecraft 'back to basics' with coredinations cardstock. The butterfly was cut with the MS monarch butterfly punch, with flat back pearls. Computer generated sentiment punched out with the Stampin' Up word window punch. Added some MME flower buttons to finish. Whilst I'm here - TOMORROW IS WINNERS DAY!! YAY!! We'll be posting the winners of all the closed challenges in the tab at the top tomorrow evening so check back to see if you're one of them! Onwards to the challenge and haven't they done well woweeeee! This was my challenge for the team "Plastic", I have been gagging to make this butterfly so now was the perfect time I have used Friendly plastic, a gold and a green, I chopped some of each colour into each wing and added little gems of the same colours, its backed onto foil and beads attached. I have the sentiment but it wouldnt fit on the card right, so I wrote it out and embossed it. Step by step destructions will be on my blog . For this week's super challenge, I've used shrink plastic...for the very first time! And despite having visions of ending up with a small globule of melted plastic on the end of my tweezers, it was actually quite easy and great fun! I stamped Tilda onto the plastic, but coloured her on the 'wrong' side in quite strong colours. This was the hardest part as the plastic didn't seem to like any of my mediums very much - they Lyra pencils ended up the best. I then cut her out and heated her with the heat gun. 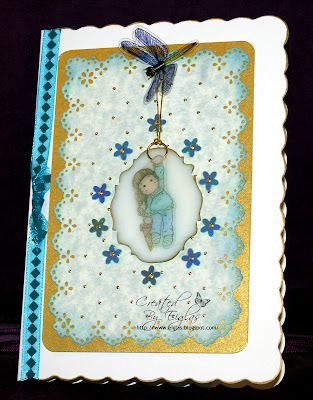 Then I used my Tim Holtz Baroque Bigz die to cut out the medallion behind Tilda and heated that. Tilda was adhered with jewellery cement and a jump ring attached. I then inked the edge of the medallion with a Krylon 18ct Gold pen. THis whole was then attached by a piece of gold thread to the card and the little sequins added. Lastly an acetate dragonfly was adhered. The gold spots are just peel-off waste. I used Friendly Plastic for my card this time, I melted the Friendy Plastic with my heat gun and used a heart shaped cutter (like a metal cookie cutter but much smaller) to cut the hearts - can only do 1 at a time because the plastic has to harden again before you can remove the cutter. 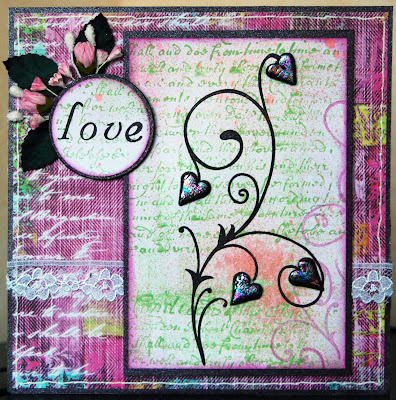 I stamped a swirl on to the stamped & distressed background and glued the hearts on to resemble flowers. 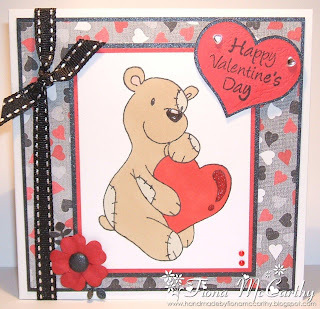 I had to make the word love from alphabet stamps and stamped onto another piece of card. Added lace and flowers to finish it off. I saw flowers made from printed acetate sheets on TV and I thought 'I can do that' lol. So I cut some flower shapes from acetate, inked them up with alcohol inks, heated the acetate and shaped the flowers. They are fixed together with pretty jewel brads. The box is painted with Tecso childrens paint and I used a couple of punches to pretty things up. I will put full details of how I made this on my blog. I've used plastic in a number of ways on this one. First, the main image is printed on polyester film. I've mounted it on sparkle paper (which is also plastic coated), and added some shrink plastic 'flowers'. The shrink plastic and background card were stamped with the same image and coloured with Sakura Stardust pens. And the finishing touch is a peel off butterfly that's backed with a white net material. I have used alcohol inks onto acetate and then stamped a floral centre and added butterflies and bees around it in stazon ink. Initially I was going to leave it at that, but as you can see from the first picture, once held up to the window the stamping didn't show up enough. Plan B. I have some of that blending solution that lets you paint on acetate so I squirted some into various Cosmic Shimmer paints and then painted the stamped images and as you can see they show up much better when it's hung in the window. If you pop over to my blog I have some more pictures plus the one that got away! Or was not good enough for the CCM Challenge! I've never really played with plastics before and have had very bad results with shrinkies etc in the past so I dug out my acetate sheets for this spotlight. Using a combination of acetate, peel-offs and promarkers I created the butterfly centerpiece which I warped a little with my heatgun so it would bend cleanly and then created a background on some more acetate with some shimmer mists and the cut it out with a nestie and then using alternating colours I used the bigger nesties to make some more concentric circles. 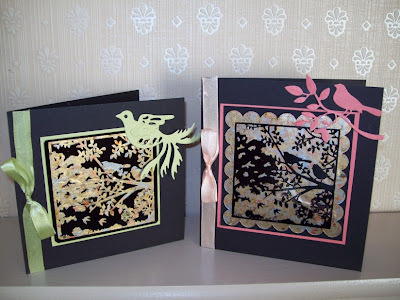 A couple more diecuts here and there and a bit of dry-embossing with a cuttlebug folder and a bit of silver sparkly paper completes the background. Thats it from us so come and challenge yourself and have a play with plastic! Good Afternoon and thank you soooo much for your entries to our last challenge of Floral and our Spotlight on Water which still has a week to run! Some absolutely amazing creations out there! The winners of all closed challenges will be announced on 15th Feb.
Lisa has set the theme for this challenge and she wants to see HEARTS! 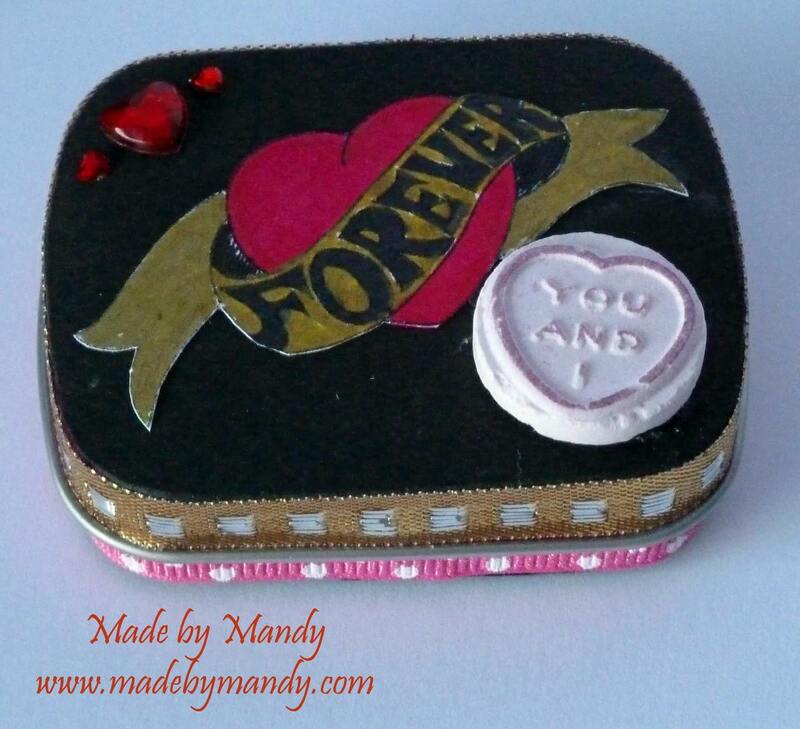 Given Valentines is just next week then I hope we see lots and lots of creations! Just a quick reminder of the rules - You can create anything, we're called crafty CARDmakers but thats because I couldnt think of anything more inspired lol! So long as you hand craft it and it follows the theme go for it! We do have a maximum of 3 entries per challenge, this is because some crafters are slower than others so it just makes it a bit fairer. Please only enter NEW work. We post at 12pm on Mondays so any blog entry timed before this will be deleted sorry. You need to backlink to our blog so that we know you're wishing to enter. We have seen a huge increase of people entering multiple challenges but then not bothering to link to us. We dont mind how many other challenges you enter but its only fair to others who have taken the time to link back. If you're new and dont know how to do this, there is a tutorial on this here. We're sponsored by The Stampman for this challenge who are offering a £10 voucher to use in their online store, shop or show! They have a huge variety of products to suit all tastes including Hero Arts, Aspects of Design, Tim Holtz and Ranger and have also recently added some scrummy Prima papers to their range! Lets see the girls designs! 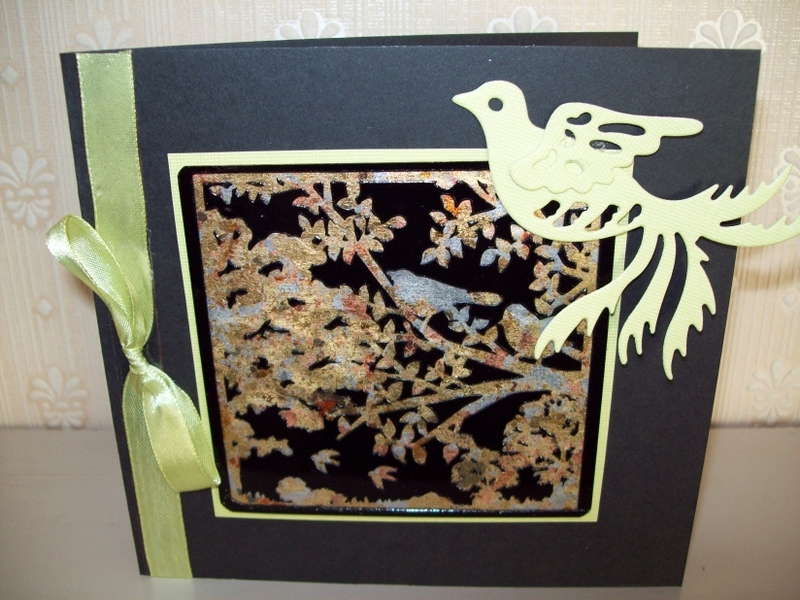 I've used a large 8" square card blank. The papers are digi ones from Sweet Shoppe Designs printed onto linen card, with pink linen cardstock from my stash. The image is a Sugar Nellie 'simply sassy' stamp, coloured with promarkers and koh-i-noor pencils. Hearts cut on the Cricut (plantin schoolbook cart), numbers cut using the Sizzix 'night & day' alphabet and flat back pearls to finish. I wanted to do something different for this wee challenge and after having a look through my crafty mags I had an idea to use my fimo! I cut loads of hearts form pinks, reds and white fimo then stamped on to them using a script stamp and some gold embossing ink! Baked the fimo and glossed! The card is made using some free hand-drawn hearts layered up, lots of glitter, some alphabet stickers and the hearts to finish! For my card this week I decided to make a Male Valentines Day card. It's for my husband, a second attempt as the first one I made him turned out too girly lol. I have used a stamp by CC Designs called Valentino and coloured him with ProMarkers.I have also used some Anita's clear gloss finish on his nose and a little glitter on the heart. The greeting is a stamp from Kanban and I have used my Cricut to cut the little red and black heart.The paper is a freebie from a set over at Summertime Designs. I made this using a download of vintage bits, but I downloaded its years ago, so im sorry I dont know where I got it from. I made the backing papers with sticky fingers sprays and scrunched it up and swipped with barn door. The Sentiment is a Tim Holtz Salvage Stickers, I punched out lots of hearts and added a bit of glitz with glitter glues. this card made with k and co papers smitten the hearts all die cut on big shot express flowers and velvet scrollwork from stash. I've tried something completely different for the heart challenge. I've always wanted to make one of those little altered tins but never found one small enough until last week. This used to be a little tin of mints and measures only 5 x 6.5cm. 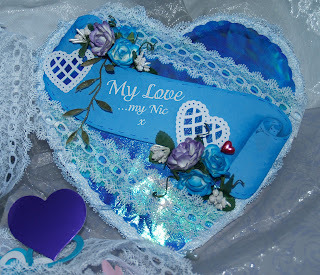 I have altered it using a small digi image, gems, Love Heart sweeties, ribbons, MS Punch, Die cuts, chipboard, felt and lace. I don't usually care for hearts as a motif but as it's Valentine's soon.......! I just cut a heart shape out of a folded 21cm square card then I cut some iridescent wrapping paper the same size (I just drew round the card) then scalloped it with edging scissors. 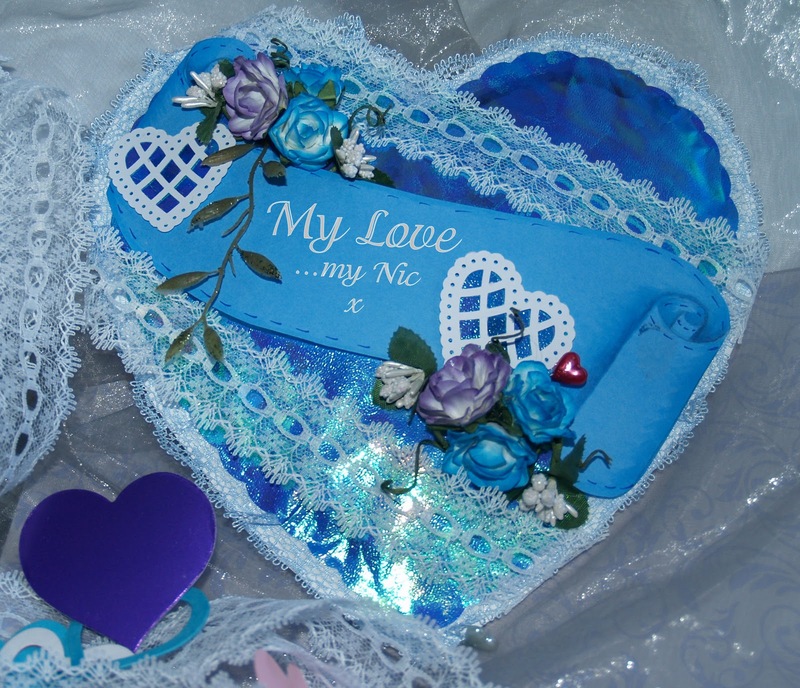 Then I edged the card with a narrow blue lace, adhered with narrow ds tape. Some bubble-wrap made the 'cushion and I stuck the iridescent paper over the cushion with silicion glue gel, covering the raw edge of the lace, and held it in place with bulldog clips. I hand-cut the scroll and coloured it with Copics and added embellishments like the MS Heart punch, the eyelet lace and some flowers. 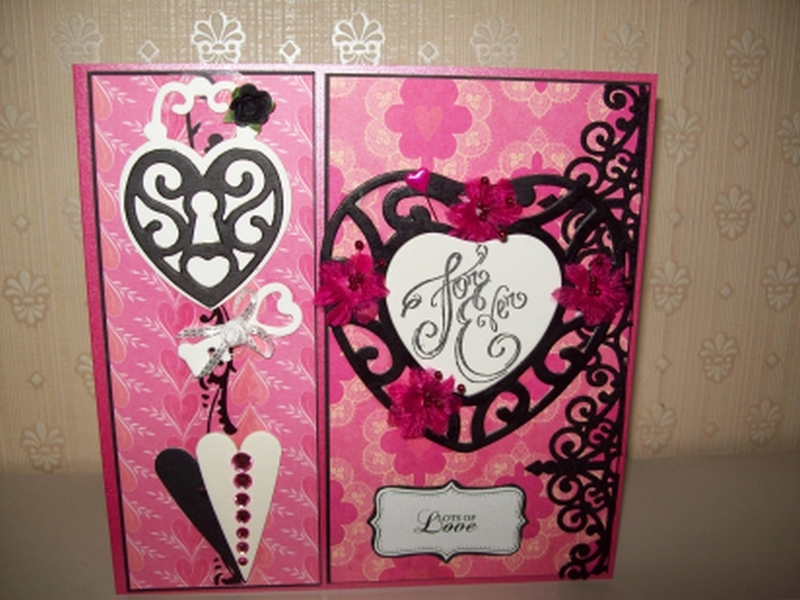 I just couldn't resist using this adorable Mabelle RO couple for this weeks Hearts challenge. I've coloured them with Promarkers and added punched hearts and also a little pearl heart. 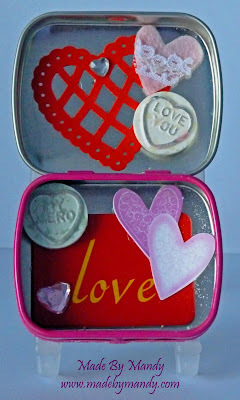 I used DCWV papers, Martha Stewart & Hobbycraft punches and Spellbinders, labels 1 & classic hearts nesties. The little flower has a touch of Cosmic Twinkles in the centre. 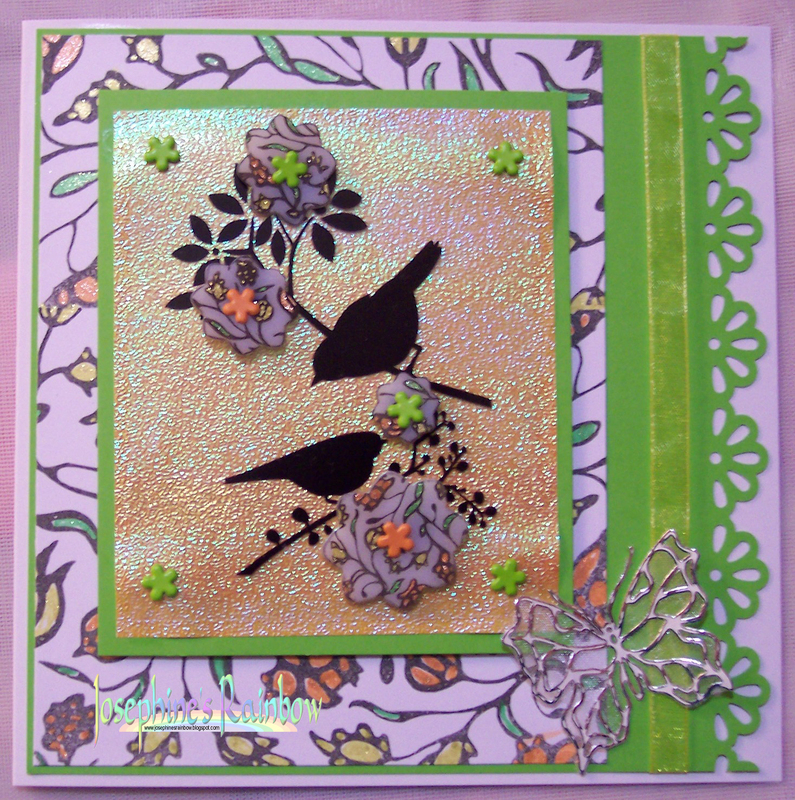 For this challenge I've used an image by Digistamp Boutique which I won recently and coloured it with Derwent Coloursoft pencils. I didnt like it at first as I'm a newbie with pencils and I dont colour animals often but I left it and came back to it and it looked better lol! Background papers are Bearly Mine Designs and I've added a little love charm which I'm surprised I found seeing as my 2 year old got hold of my box of (organised) charms and they're now rather random! The colours I have chosen this time are fairly masculine but with a bit of shimmer. 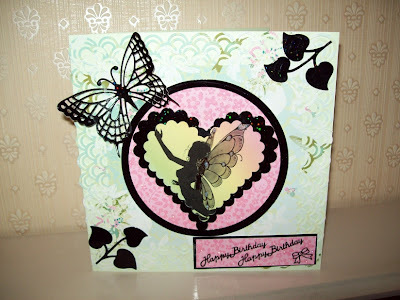 I have used cosmic shimmer mists in aqua lagoon and twilight black to create both the paper which I have embossed and cut the 2 paper hearts and also used it to spray paint the stamped plastiroc panel in the the centre of the card. I then used a long card in a co-ordinating turquoise colour with a panel of silvery shimmery webby background topped onto that. A piece of sheer black ribbon down the centre to centre the 3 hearts off and the addition of 3 ice blue heart gems to add a bit of bling. The hearts are embosseed sizzix embosslits and I ran one heart thru with the paper upside down so that the embossing is reversed on them both and also altered the orientation of the heart.